If you right-click over a file in the File list tab in Visual Installer’s editor, a local menu is opened. In the menu there is an option with the name File copy options. Checks a file’s date and time before it is replaced. The file will only be installed if it is newer. Checks a file’s version number before it is replaced. The file will only be installed if it have a higher version number. If a file with the same filename already exists in a specified folder, the file will not be installed. Check this option if a file must be registered during the installation. Some components and DLL files require this. Write protection will be turned on for the file after it has been installed in the hard disk. An information message box will be shown if the file already exists on the destination drive. 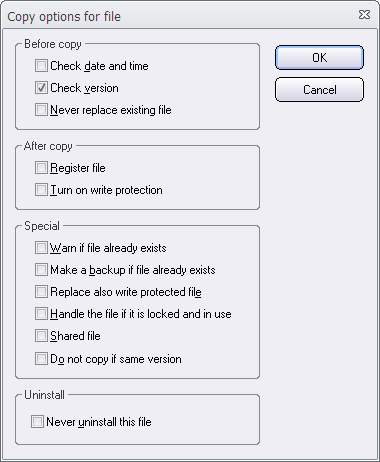 The end-user can decide if the file should be replaced or not. If you check this option, a backup will be made of the file if it already exists in the destination folder. The backup file will get the filename extension “.BAK” and it will be placed in the same folder as the original file. If this option is checked, a file will be replaced also when it is write protected. Sometimes a file can be in use during the setup process, and then it can not be replaced at that moment. If you check this option, the file will be marked in the system to be replaced next time the computer restarts (during the boot process). If a file is shared with other programs, you can check this option. This will prevent the file to be uninstalled by mistake. If this option is checked a file will not be copied if the version number of the source and destination files are equal. Prevent uninstallation of the file. If your project is uninstalled, the file will remain on the user’s hard disk. Instead of right-clicking over a file to open the local popup menu, you can also open the List menu and choose File copy options there. 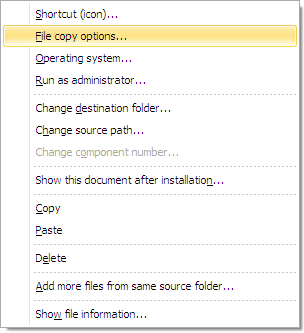 If you need to set copy options for more than one file at once, this is also possible. Just select the files in the file list, and choose the File copy options menu item (either from the List menu or from the local popup menu). In the Inst column in the file list you can see current copy settings for each file in the file list. More information is available in this blog post. This entry was posted in Information - Products. Bookmark the permalink.